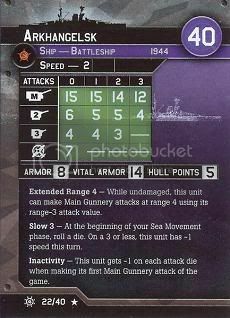 Same stats as the HMS Royal Oak (they are sister ships after all), except -1 to secondary gun values and Inactivity. Skip it and go for the Royal Oak. If you do have to use it, fire a salvo at a destroyer or light cruiser to shake off Inactivity and bring her as quickly into battle as the Slow 3 allows her to. Keep in mind that her SA states that it is the first Main Gunnery attack, so using its secondary or tertiary guns won't do anything. Anyhow, I like this ship. Good guns and armor. Inactivity isn't a big deal, only one die (I was mistaken, -1 on each die; that actually is somewhat significant). comment by Tych: Inactivity costs you -1 on each die, not one die. Same sculpt as HMS Royal Oak.